When faced with a daily deluge of courgettes, it's easy to begin to feel slightly overwhelmed at the challenge of appreciating all this bounty. I have a number of recipe books in my kitchen to turn to as well as coming across some nice glut-busting ideas on the internet and in magazines. I thought a round up might be in order. In my own kitchen I turn to Dr Hessayon's Garden to Kitchen Expert, Sarah Raven books, Hugh Fearnley-Whittingstall's Veg Every Day and Nigel Slater's Tender Vol One (the veg one). Last night, I cooked the ratatouille (minus the aubergine but with lots of courgettes- fruit, baby leaves and stems) from Kitchen Garden Experts, teamed it with a Mary Berry beef mince sauce and sandwiched it all together with lasagne sheets. Delicious. Chop the male and female flowers and sauté in olive oil with finely chopped garlic for a pasta sauce or risotto flavouring. Stuff the flowers with ricotta, layer into a non-stick pan, drizzle with olive oil, cover with a lid and steam/fry over a medium heat for 5 minutes. The steam from the ricotta will cook the flowers. Season and serve. From Veg Box: Lemon Butter Courgettes. Plot to plate in less than 15 minutes. Butter, lemon, olive oil, courgette. Simples. 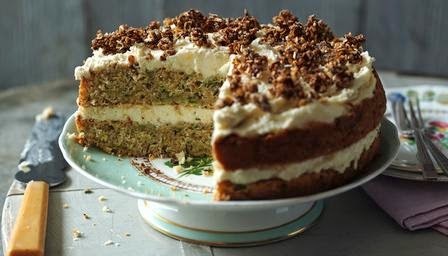 A courgette and caraway cake with apple flavoured cream cheese frosting and caramelised oat topping. Now, be honest, if you saw this on a stand in a café, you'd want a slice wouldn't you? I know I would! This cake is from chef Valentine Warner; It looks, and probably is, delicious. I make a fantastic pork and barley stew by this same chef; on that criteria, I'd say he knows how to make really tasty stuff. Courgette and caraway cake. Image courtesy of BBC Good Food website. Roasted vegetables (including courgettes or whatever else you may have lurking) from that queen of the kitchen, Mary Berry. Actually, this is a great end of week meal to throw over couscous or rice and to use up all the veg in the fridge before a Saturday shop. 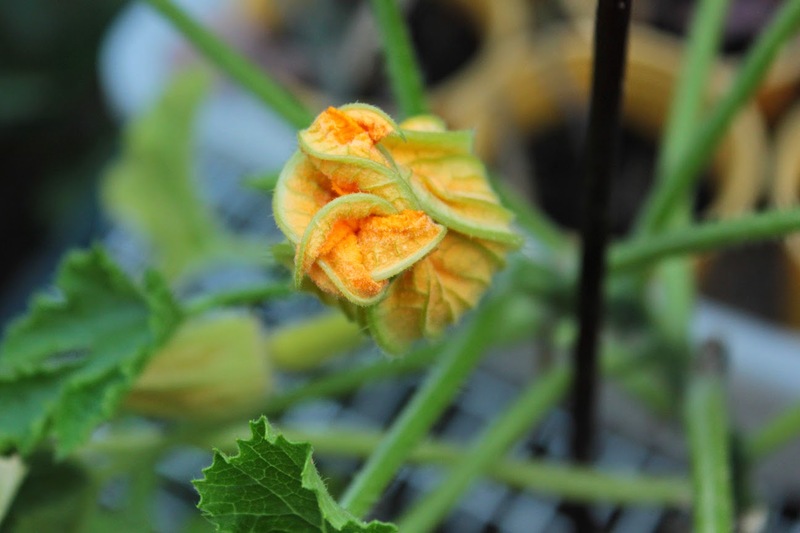 Sweet stuffed courgette flowers. Initially this looks like a right faff but, oh my goodness, I bet these are beyond yummy! A recipe by John Torode (the grumpy one from Masterchef), wherein he stuffs courgette flowers with a crème pâtissière, coats with a light batter, fries them, then rolls them in cinnamon sugar. A bit like 'healthy' custard doughnuts, eh? Recipe also includes a boozy raspberry syrup - I'm not sure these fritters would last that long in my kitchen. Sauté potato and courgette. Quick and a delicious side, or a meal in itself with an egg on top, but note this recipe serves only one. Personally, and I don't know what this says about me, I could easily eat three times this. You'll need potato, courgette, garlic, oil, a few herbs, seasoning … and a fork. This is my kind of food. Citrus and courgette ribbon salad. Garden ingredients are salad onions, courgettes, parsley plus lemon, walnuts and olive oil. Add a glass of chilled Prosecco, some warm evening sunshine, a table in the garden and who needs to go on holiday? Courgette pancakes with spiced greek yogurt. Goodness, is there no end to the versatility of this vegetable! This is lovely finger food - roll them up and dip away! I guess any children might have to get over not finding chocolate and banana in their pancakes but would soon get over it if a variety of dips and toppings were on offer. There's heaps more to inspire on the BBC website. And if the blighters do start to get the better of you, there's always Hugh Fearnley-Whittingstall's River Cottage Glutney, a fantastic way to preserve and eke out those delicious summer flavours. That link also has Slow-cooked courgettes on toast and a courgette moussaka. Unsurprisingly, my thoughts are veering towards snacking on courgettes and toast for lunch tomorrow. There, that should keep us all going. 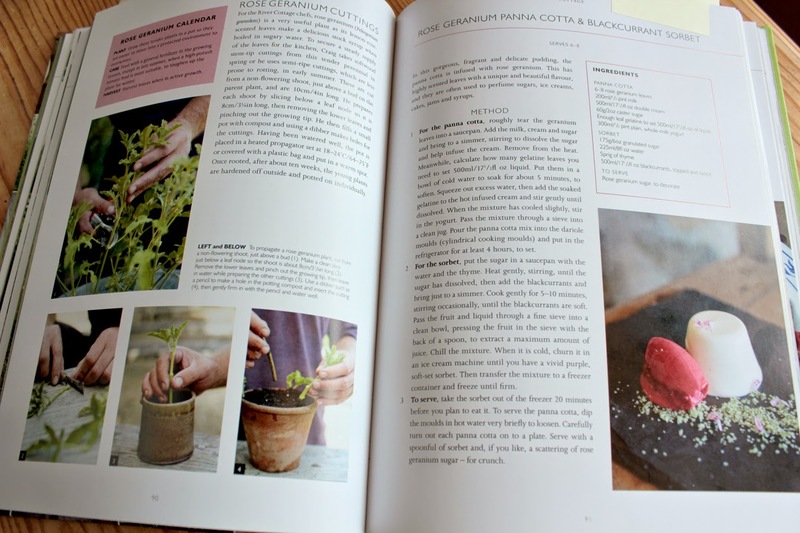 Actually, I'm beginning to wish I'd grown a couple more plants… I could do with a glut after reading all those recipes. 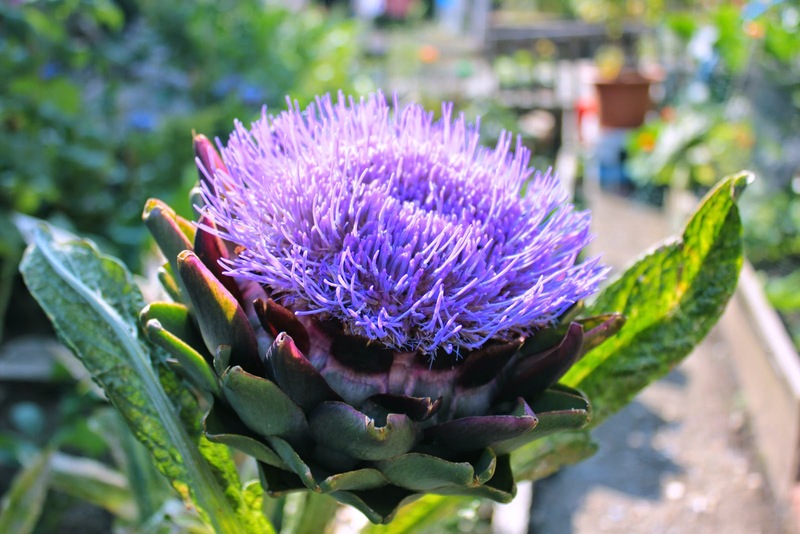 Kitchen Garden Experts - Inspiration from plot to plate! 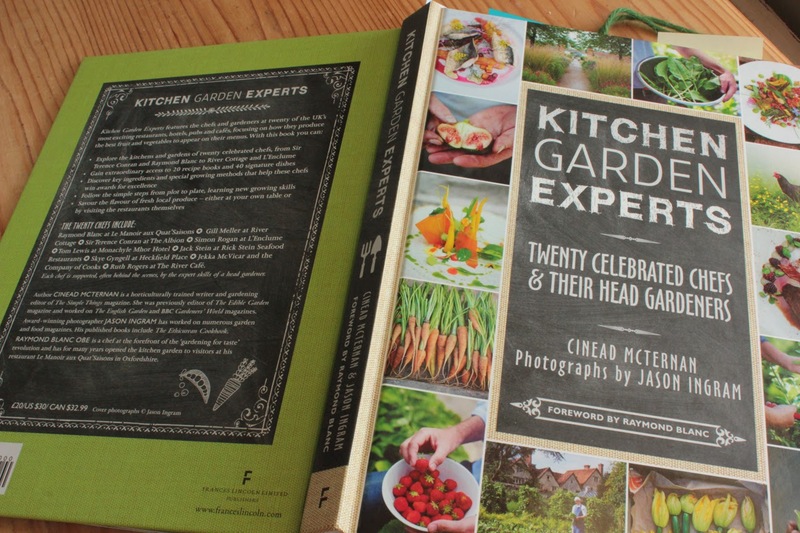 I'm not one to rush into things but I have excelled myself this time by only just writing about a book I received a goodly while back, 'The Kitchen Garden Experts'. I'm aware it's been reviewed elsewhere but let's look again, shall we? It's a rather nice book about the collaboration between twenty UK-based restaurant chefs and the chosen ones on whom they rely to grow their veg. It's hard to categorise this book; after an introduction to each restaurant, it's part biography, part garden inspiration, part cookbook. 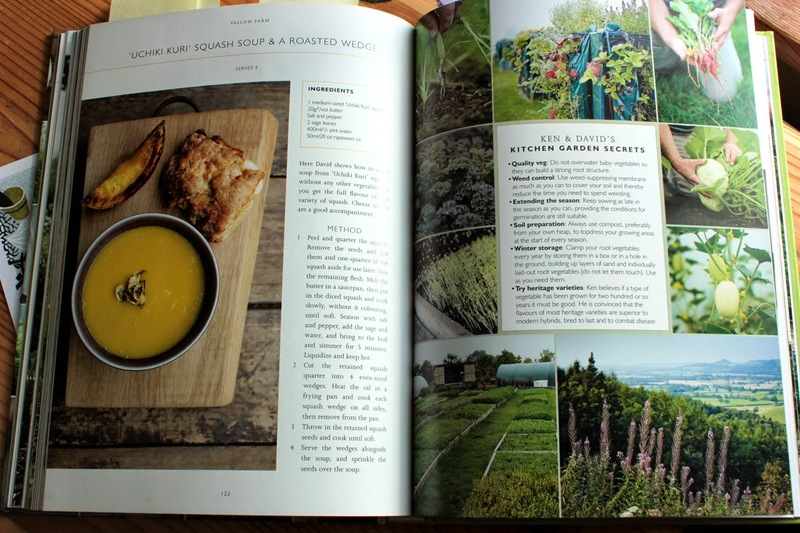 It explores those restaurants that have thrown their weight behind the idea of home-grown/local, sustainable and seasonal food for their kitchens and how they achieve that throughout the year. 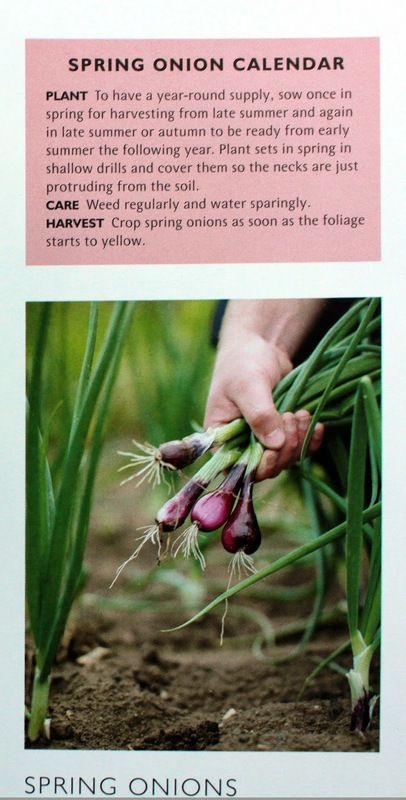 The author, Cinead McTiernan, has obviously had unparalleled access to both gardeners and chefs alike as each chapter is full of their expertise, with the balance tipping slightly towards where it all starts - in the garden. It's beautifully written with more than a passing glance into the reality of life in a large kitchen garden. It has particular relevance now, in the summer, as the garden starts to produce plenty of food for the kitchen but I'd not be unhappy to get this book for a bit of autumn or winter reading, at a time when we're all deciding what to do with our various plots in the following year. The concept of plot to plate food of the freshest quality is not new - my grandfather grew all the veg for the kitchen in his enormously long back garden - but it wasn't a trend then, it was how you fed your family. Of real interest in this book, for me, is the way that the chefs and gardeners work together to put seasonal, no-to-low miles food on the menu of their various gaffs; they listen to each other's ideas, growing and creating food with a modern combination of flavours. Putting the end product aside for a moment, I was fascinated to read the methods that the gardeners use to get the best from their gardens and how to get the quantities right. That's real talent, keeping enough seasonal salad leaves on the go to provide for meal after meal. Sounds a nightmare to me but there are golden nuggets of information to be gleaned here. 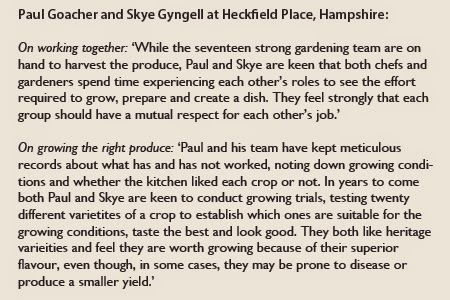 By showcasing both the head gardeners and the chefs together, with the restaurant that they work for (or own! ), there is a nice continuum from plot to plate. Not all the recipes appealed to me but then I don't cook dinner party fare, just hearty fill-your-boots food for teenagers. That doesn't mean that I wouldn't like to try raspberry cranachan or rose geranium panna cotta. There's a delicious recipe for a classic summer stew of ratatouille (what to do with that courgette glut!) and I quite fancy the rainbow chard and bean soup as well. On the flip side, I could leave recipes such as the plate of 'Beetroot textures'; undoubtedly eye-pleasing, it's firmly in the fancy restaurant dish category - a meal of style over substance. But that's just me - someone else might need a menu to impress and find this perfect. Although my training is taking me towards garden design, I'm plot to plate obsessed and will always be first and foremost a food grower. I'm fascinated by every aspect of it, from foraging to unusual edibles to the benefits of growing your own and hunt out and save recipes using food that I grow. A garden visit is made so much more appealing if there's a kitchen garden included and I'm curious to know how such food growing spaces are managed for effective production. For all of these reasons, I found 'Kitchen Garden Experts' an absorbing read; it's a definite bonus that the book is visually beautiful* and engagingly written. I'm more than pleased to add this to my gardening bookshelf. Hopefully, this black box below will work as a slideshow of a few recipe photos to whet your appetites! There are many more recipes, of the type that you might find on Masterchef, eg Whitby lobster with quail's eggs and garden beans, and all the recipes have detailed instructions on how to prepare the food. An opportunity to brush up on dinner party skills perhaps? * photos by Jason Ingram who won the Garden Media Guild Photographer of the Year award last year. Disclaimer: My thanks go to the publisher, Frances Lincoln, who sent me the book to review; it is available through their website or the usual online retailers. I bet the kids can't believe their luck, all this hot weather to kick off the end of term holidays. Not so for us poor gardeners though, struggling to protect our plants from this mediterranean-like heat. To cap it all, there's been a good stiff breeze running across the garden for the past couple of days wicking any moisture away from the leaves and encouraging transpiration which means that roots need more water otherwise the plants bolt, set seed and generally just keel over. *not that early judging by the shadows creeping over the path! 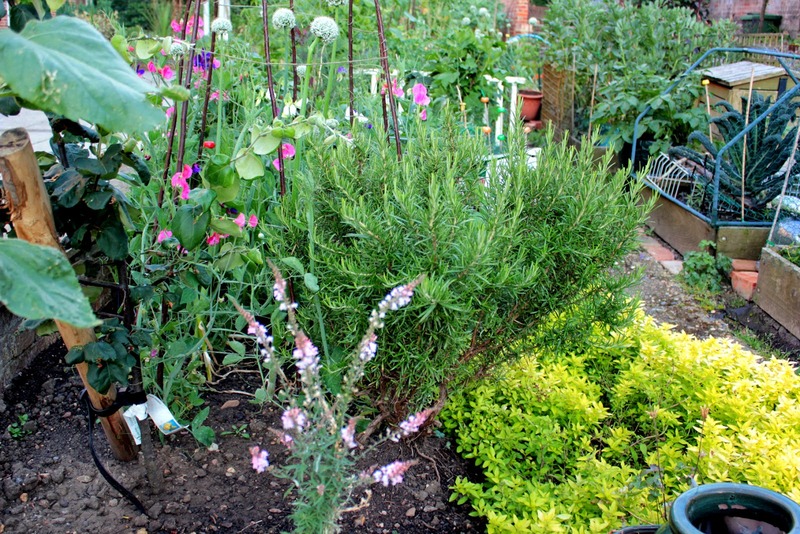 ** The Hot Border is a part of the garden that I'll do a post on soon as it's an ongoing renovation. Oh boy, it's hot. And I'm so grateful that I'm not in a car, travelling down to the seaside (one of the options for my weekend). Or on a bus. Or a train. No, I was in the garden yesterday since early o'clock, having woken in the night to the sound of tumultuous rain and a tremendous thunderstorm. As I'm on the second floor, the roof level guttering runs along ceiling level, making the rain sound like a trickling river running through the flat. It's one of the best features. Rain means softer ground; more rain (forecast) means plants and seeds will get off to a good start - once I've protected them with anti-slug wool pellets (which, by the way, work). Rain also means the garden gets a good soaking, a long overdue watering which I'm hard pushed to provide without a tap in the garden. 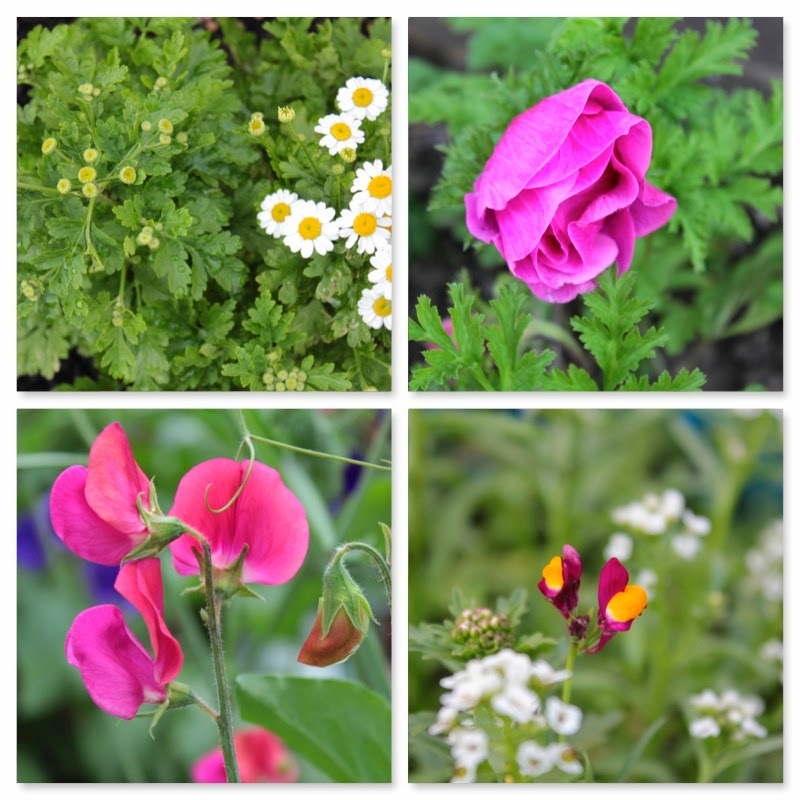 I had a walk round the garden with my camera on Thursday evening because I realised that my plan for integrating flowers among the veg growing is working, with little flashes of colour appearing all over and bees buzzing happily around. 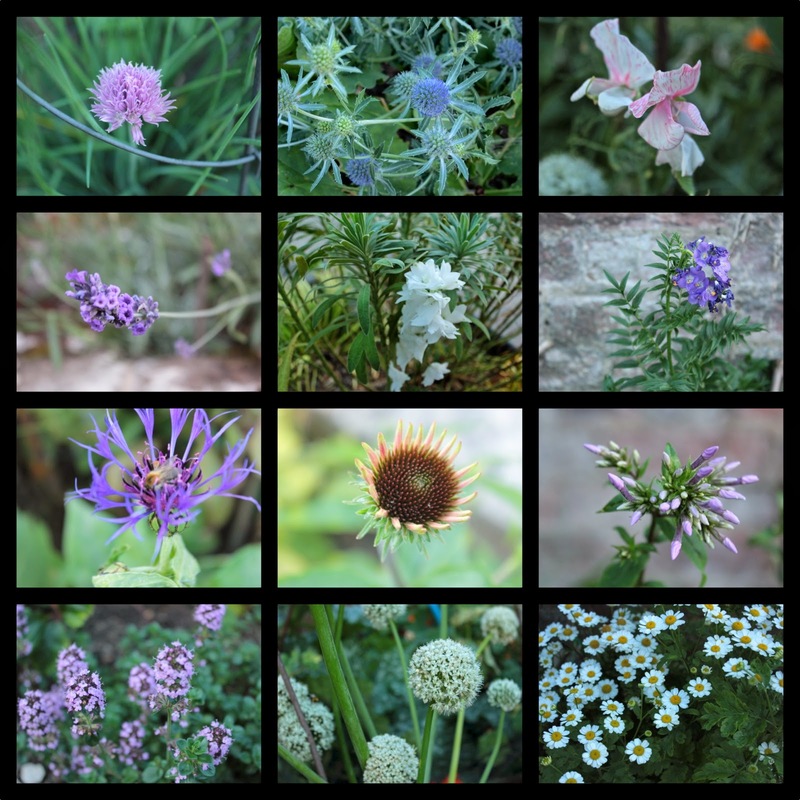 These are the photos taken (sorry, not all in perfect focus as it was fairly late in the evening); today more purple has appeared as the phlox paniculata has unfurled its petals. Never mind the sunshine and heat - this is what my summer is about. And, of course, the veggie greens! 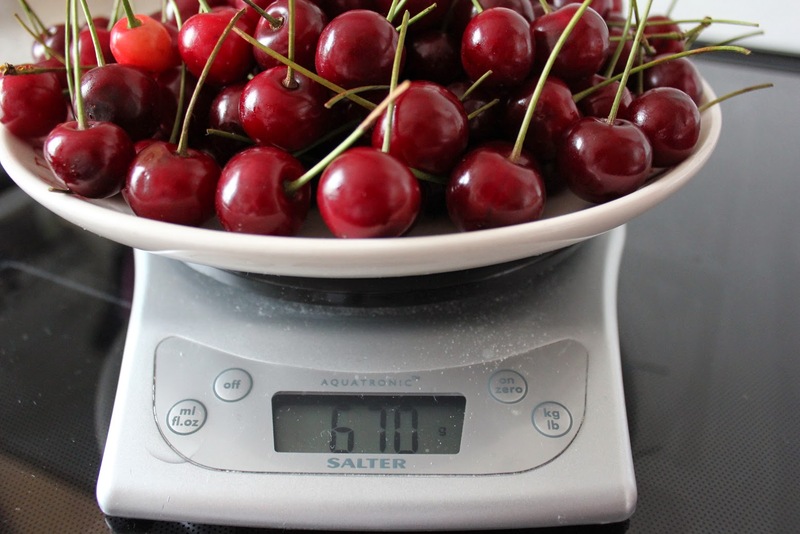 So we're having a summer of festivals, sunshine, music, happiness, flowers in your hair and chilling… but don't get excited - when I'm talking about being stoned, I'm only talking about cherry stones (or pits/pips, whatever). 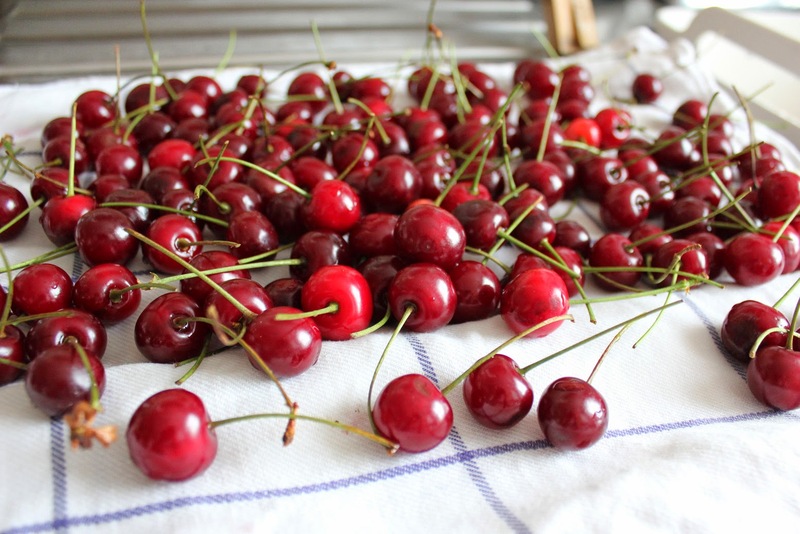 You might remember that the cherry trees under my custodian-ship are both Morello, bought at the beginning of the community garden when there were quite a few of us. 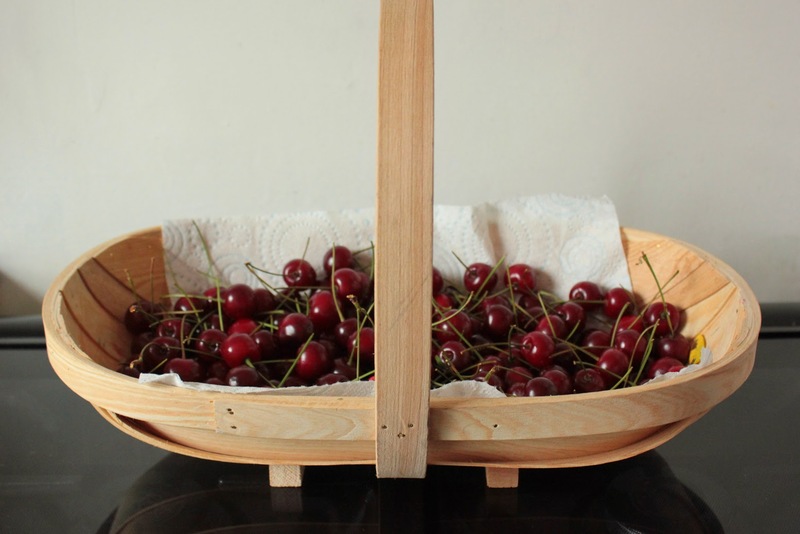 I'm not sure how the decision was reached to buy two sour cherry trees but every year those two trees are my best producers and, ironically, I don't even like sour cherries. Neighbours were told to help themselves as the fruit ripened but it didn't happen. I returned from a few days away to find deep dark cherries on the point of spoiling with none picked. Not being one to waste good food, I checked through my cookery books (so many recipes for sweet cherries!) and googled for more inspiration. Not fancying a cherry chutney or pickle (good with duck), I thought I might be safe with a cherry crumble from an American website. The country is renowned for its cherry pies and cobblers so what could go wrong? Salt, as it happens. But first, time to gather the fruit in. I popped down to the garden with scissors and a trug. Having this year got wise to the fact that ants love the fruit juice and were swarming all over the fruit (unlike my experience last year), I returned home with just under a kilo of fruit and, it turned out, 4 small spiders, numerous teeny tiny caterpillars and 2 ants. As I picked, I'd discarded another kilo of fruit as it had little boreholes in it - either something had crawled in or out of those holes, best not to risk it - or had just become too overripe. With home-grown, it's always wise to check and wash, then check again. Yin/yang, there's a balance to everything with organic, pesticide-free gardening. with one spare for the freezer. One word of caution: this should have been utterly delicious; ground almond crumble over vanilla scented sweetened cherries … BUT! why oh why did the recipe call for salt? 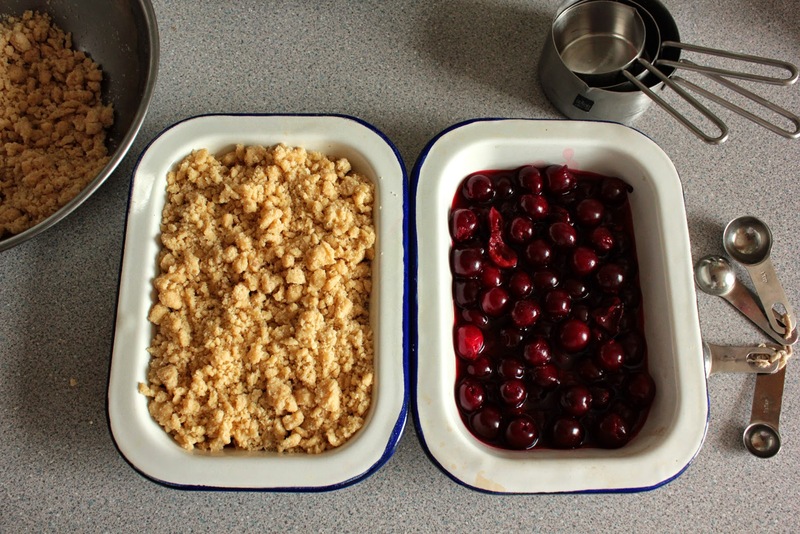 In both the crumble and, more bizarrely, in the cherry mix. 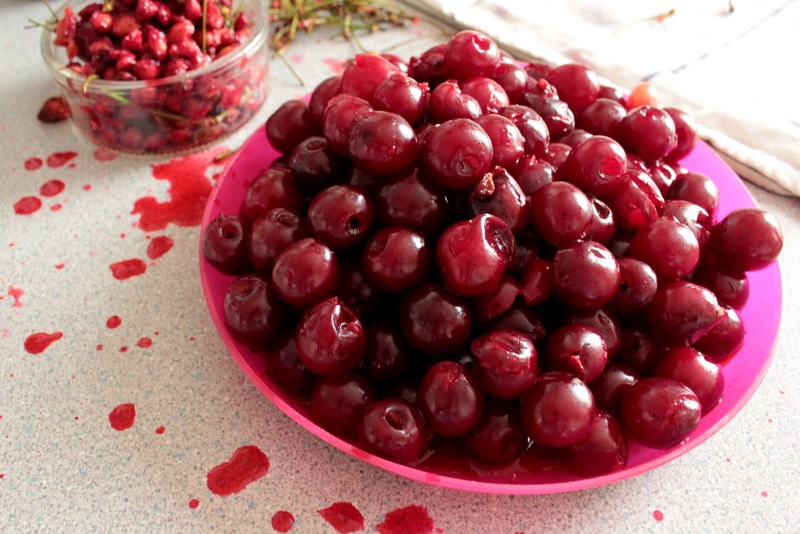 Also, lemon juice and zest in with sour cherries? With hindsight, no, not good. (Unless, of course, you're a big fan of Heston Blumenthal.) I blame my obsession with following a recipe to the letter the first time I make something; next time I'll trust my judgement. Looks nice though, doesn't it? So it's bye, bye American Pie but I'm going to see if I can rescue/start again with the second crumble and cook it with sugar and a good slosh of last year's delicious sloe vodka. It wasn't unpleasant, it's just that the hint of salt enhanced the 'sour' element of what I was eating and I was kinda trying to get away from that. 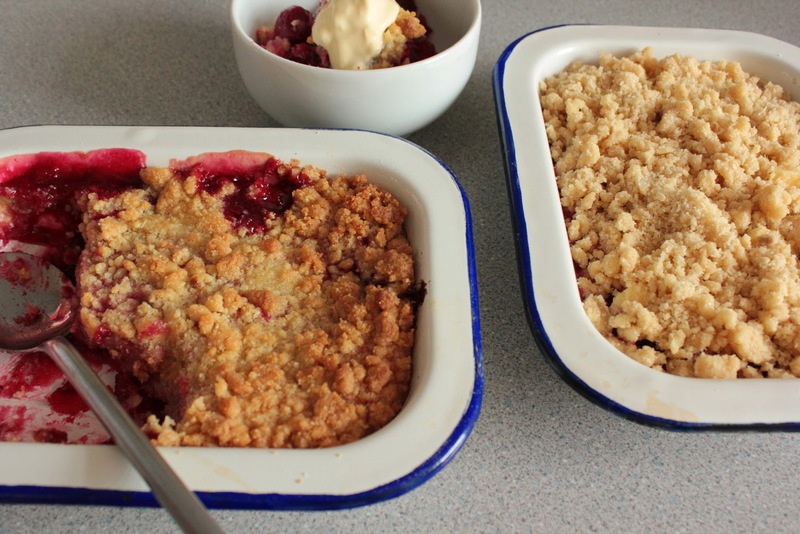 With a few amendments - if you have sour cherries to use up and want to give this a go - the crumble top would be sublime if the salt is omitted. The filling needs adjusting - leave out the salt and lemon juice, use 2 spoons of cornflour or arrowroot instead of 3 spoons of 'flour' (I did) and add a touch more sugar and vanilla - and possibly some booze. Then, I think, it would be crumble-icious. Finally, having stripped the tree of its fruit, now is a good time for pruning. 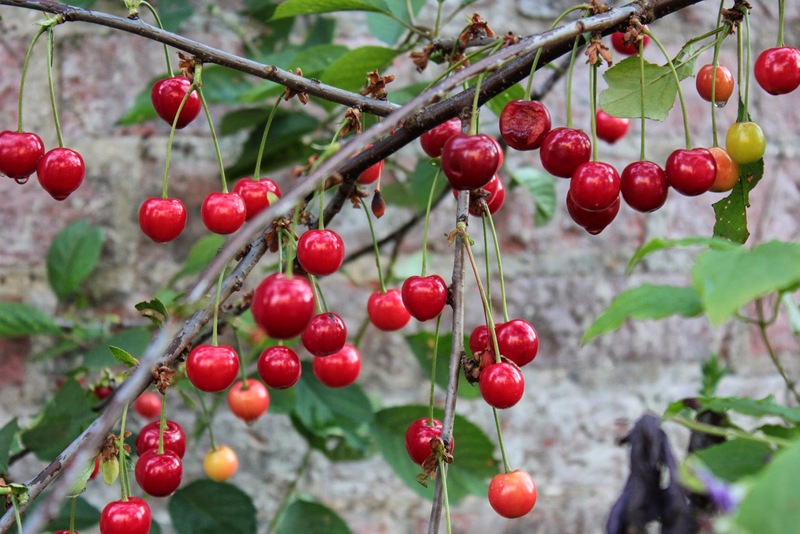 Edited to add: If you don't have your own cherry tree and have to buy cherries in, look for cherries that still have the stalks attached. 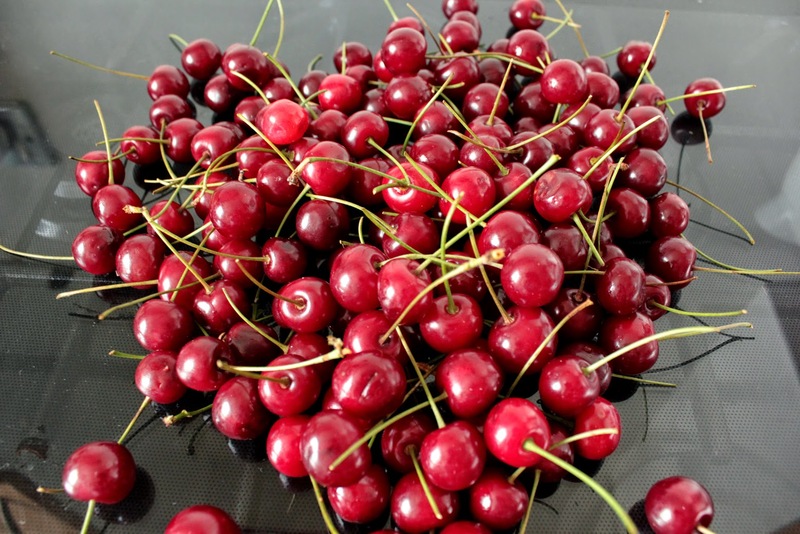 The stalks should be green, indicating that the fruit is freshly picked and therefore still full of healthy goodness. There's no getting away from the fact that gardening is time consuming. Last year I didn't give the garden as much attention as it needed and, come summer, it showed. (To me, at least.) With that in mind, I've made more effort this year with the result that it's coming together very nicely and the veg garden is definitely plumping up with edibles. Despite slugs, snails, aphids, kids and footballs, I'm making time to work on the garden and to enjoy it, because spare time is precious. I still don't have enough time in the garden but every little bit is making a difference. 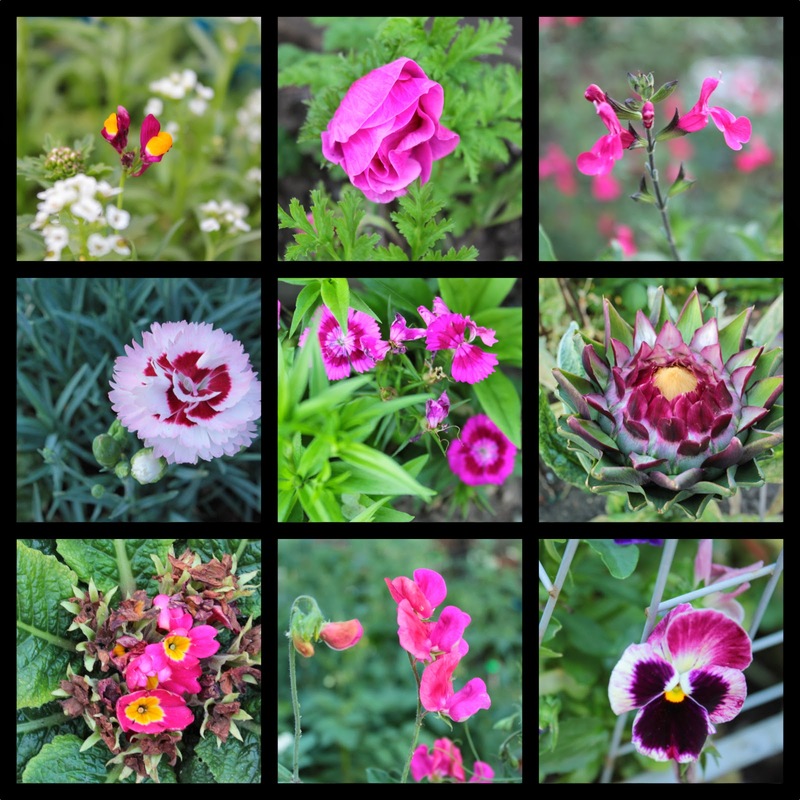 Writing this summer post has given me pause to stop to think about why enjoying the garden this year is different. My gardening obsession has gone way beyond growing a few beetroot and trying to identify plants. 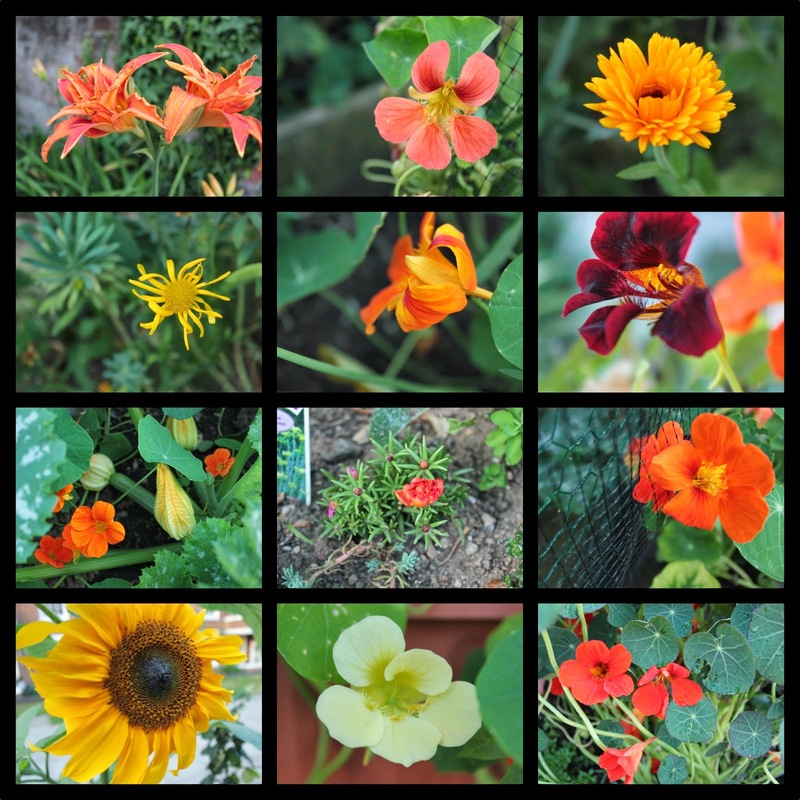 Six years of helping myself to the community garden space, training in garden design/horticulture and engaging with the wider gardening community via blogs, lectures and visits to shows and gardens has undoubtedly given me a lot more confidence in what I'm doing. 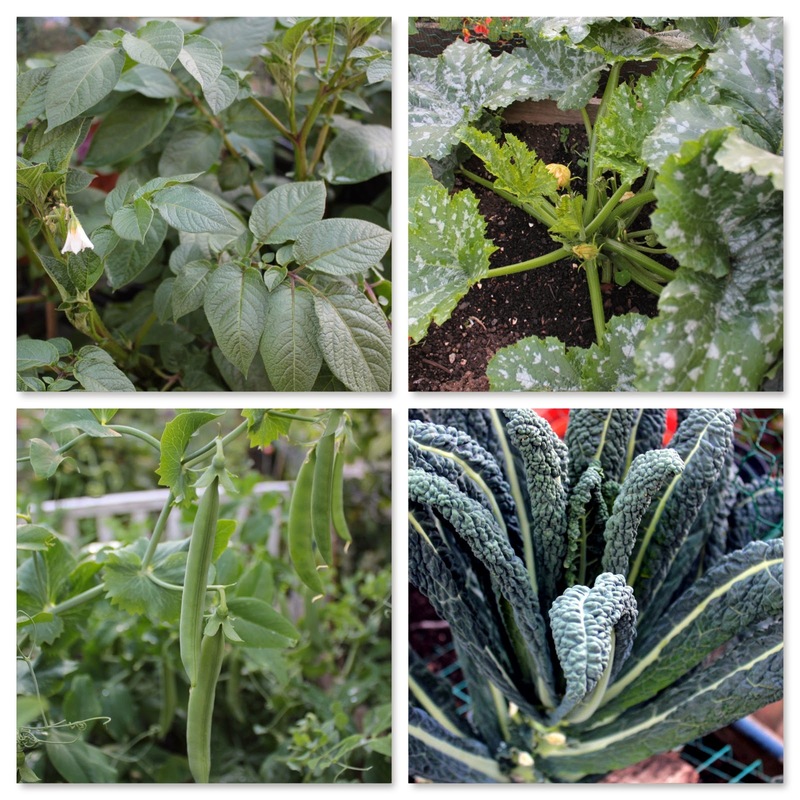 The result, this summer, is that the veg garden is full with lots of mange tout and peas, kale, courgettes, beans and tomatoes growing, brassica plants for the winter, fruit and herbs. 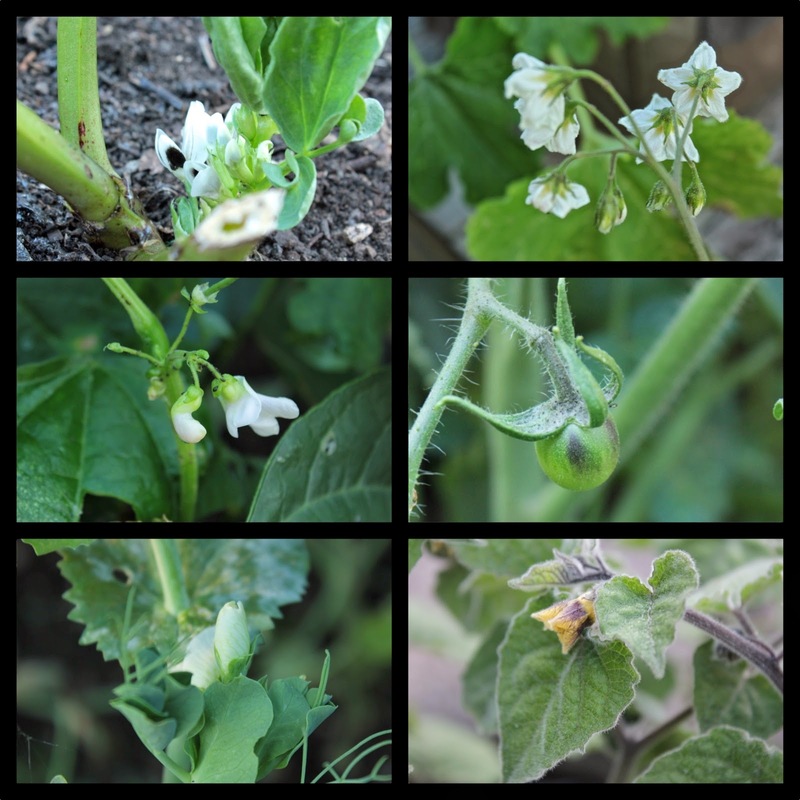 Space is made for unusual edibles such as Cape Gooseberry, asparagus, artichokes, cucamelons, golden mange-tout and giant sugar snaps. I'm also not averse to removing plants that aren't working for me. All last year's strawberry plants will be being torn out as I don't like the flavour (but the slugs do). This year's Mara des Bois strawberries are so much nicer, and I'm thinking of planting just a few standard strawberries, nothing fancy, just Elsanta or Cambridge Favourite. 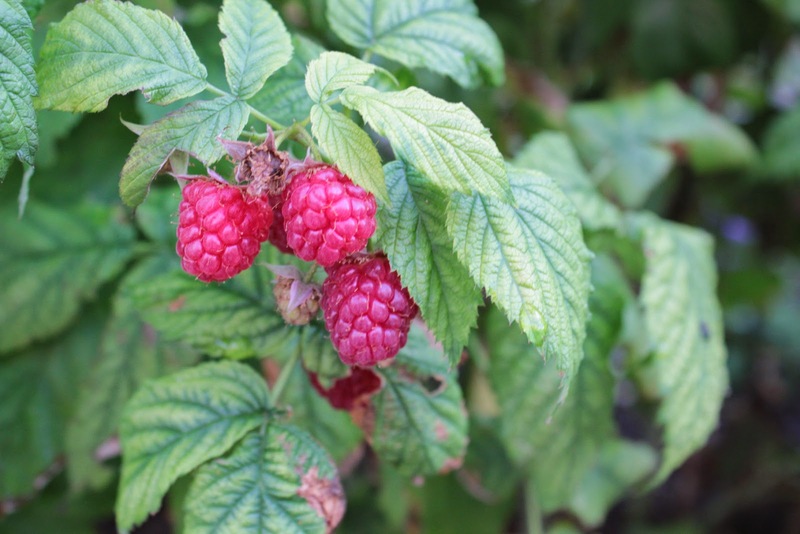 The new Polka raspberries are a revelation - large, firm, sweet. Perfect. Autumn Bliss raspberries, you've been warned. These are early Autumn Bliss from last year's canes. The warm and wet spring was a mixed blessing: more pests but I was able to sow earlier; more sunshine and rain meant that my lettuces and salad leaves bolted as soon as they were ready to eat, even the baby leaves! Rows of radishes and beans have been slimed and munched before roots could form. But all that doesn't matter now that mid summer is here because, on the plus side, I can nibble on mange-tout pods, peas, raspberries and strawberries as I water the garden in the morning. The peas have now been picked, podded, blanched and frozen but there's still time to resow for a second harvest. I'm going to resow broad beans as well; they won't set pods before the autumn cools but I should get a crop of bean tops which are delicious steamed and served with a knob of butter and a wave of salt and pepper. (The same way I cook kale, incidentally.) Sometimes with a softly poached egg on top. Simple, delicious, seasonal. In previous years, I've felt a sense of panic as the year marches on and I get behind with my sowing, thus missing out on winter veg. Dare I say, I'm a bit more organised this year? Fruits and veg are appearing in manageable waves - so far there are no gluts, although I have seen baby courgettes starting to form. And my winter veg are good sized, healthy plants currently hardened off ready to be planted. The orange fruit of physalis form inside the green pod. When they're ready to be picked, the outer case turns brown and papery. 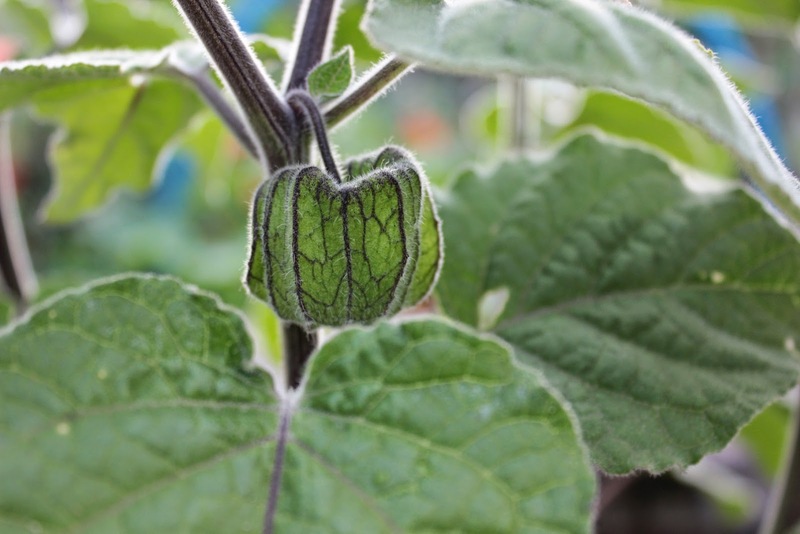 Cape gooseberries are expensive to buy but easy to grow from seed. As befits a midsummer edible garden, there's still plenty waiting in the wings. Container potatoes are flowering so should be ready soon - I might have a quick furtle to see what's in the bag. Balcony tomatoes are starting to flower and the outdoor tomatoes are growing really well; hopefully this means that they won't all fruit at once! Courgettes are appearing, tall beans, more giant mange-tout and winter veg are ready to be planted out. 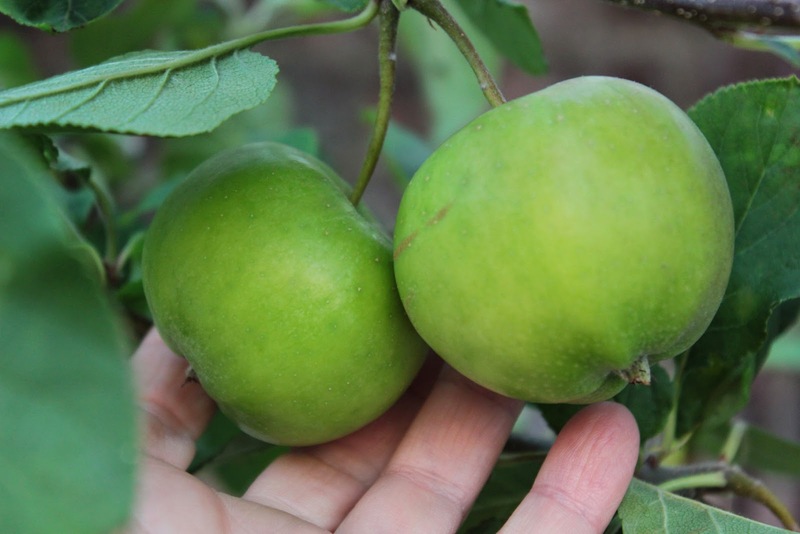 Braeburn apples are looking good for the autumn. Actually, these look more like cooking apples but they are definitely Braeburn! I wasn't quick enough with the elderflowers this year. I walked high and low over Hampstead Heath and found just enough flowers to make about 3 litres of cordial, most now frozen in small plastic bottles until needed, but this was in the very last week of local flowering. It makes sense that the trees would flower according to their growing conditions and location; being urban, London is a few degrees warmer but, as I drove back up through the countryside from the Hampshire coast last week, I saw so many elders still with a few flowers that I had to stop myself pulling over in country lanes to pick more! The up side is that I now know where all the elders are on the Heath; there's a huge amount of berries forming so I won't miss out on elderberries (or sloes!) later in the year. Yes, it's shaping up to be a very good year. 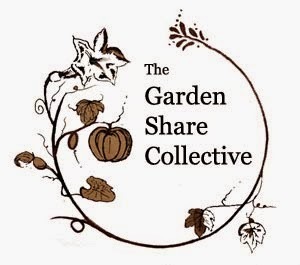 This end of month post is linking up to The Garden Share Collective hosted by Lizzie at Strayed Table in Australia. The GSC is one year old this month (happy birthday!) and is a growing group of food gardening bloggers from across the world. (Australia, New Zealand, UK and now US.) 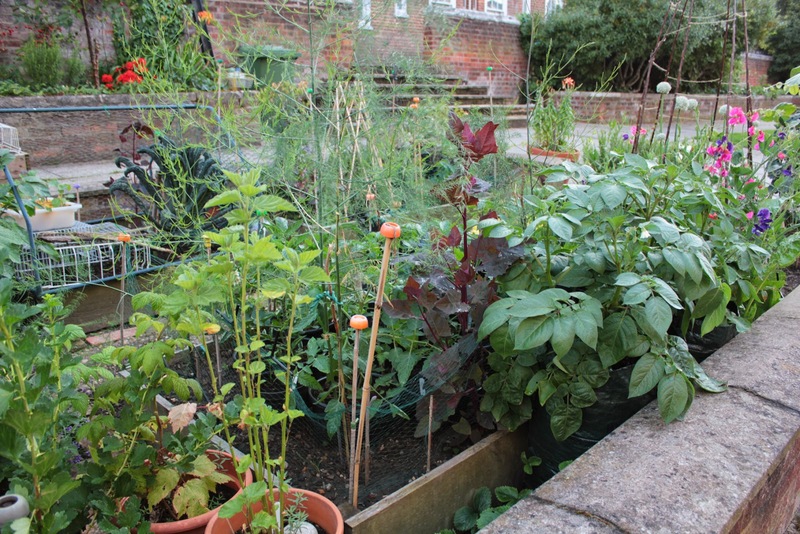 If you want to join us in our end of month garden share, click this link to find out more. Click the logo below to see what other GSC bloggers are writing.